With fall’s arrival I think of Thanksgiving, which brings me to turkey, and then to the wishbone of course! I recently purchased a pair of wishbone earrings and have loved the whimsy it has brought to my wardrobe. There is just something about wishbones that I think are adorable. If you like them too then today is your lucky day because I am sharing 16 wishbones in art, decor, furniture or fashion. This adorable vintage style greeting card is from Papaya. 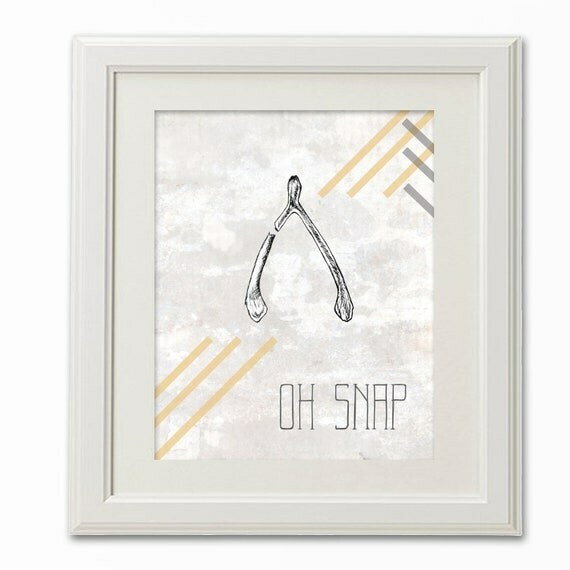 This adorable “Oh Snap” graphic has been sold out on Etsy. I love the quote. The Lucky Break company sells faux wishbones for all your crafting or party needs! Way easier than cleaning a bunch of chicken or turkey bones. Becky from Cup Half Full hand painted this adorable wishbone and framed it. And then there is the classic wishbone chair. This one is from Overstock and is $142. Not bad for such a fun color and the wishbone back to boot. It’s hard to tell from the photo, but this gold beauty is a “Colossal” wishbone from Anthropologie. It is 24 karat gold plated and 13 inches long! I’d love to have this on a shelf or stacked on a coffee table. $58 doesn’t seem crazy for the size and gold plating. 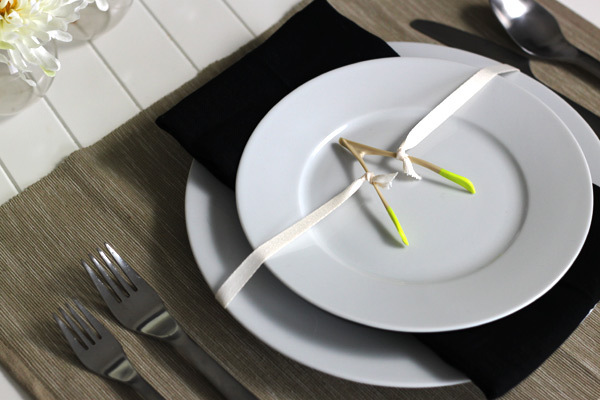 This little DIY from Formal Fringe adds a pop of color to this party. This card is sealed with a wishbone! It was a corporate Christmas card where they gave Christmas “wishes” to their family, friends and clients. The following photo needs no description, it is merely an open invitation to relax and enjoy this wishbone hammock. I love this creative wishbone bookcase. Modern and funky, but I like it. Bifftastica displayed a large wishbone collection that was passed down from family and now grace her home. That’s quite a collection! Borganic made this little charm for a necklace from a wood branch in the shape of a wishbone, quite charming if you ask me. As a wedding favor, this bride and groom painted the plastic wishbones from above and put them in gift bags that say “Best Wishes”. I love the bright colors and little bags, adorable. Carrie from Making Lemonade made a knock off of Pottery Barn’s wishbone plate. I like hers better! Click the photo for the tutorial. Too bad this T is out of stock right now, doesn’t it look cozy? Are you crazy about these little fragile bird bones too? 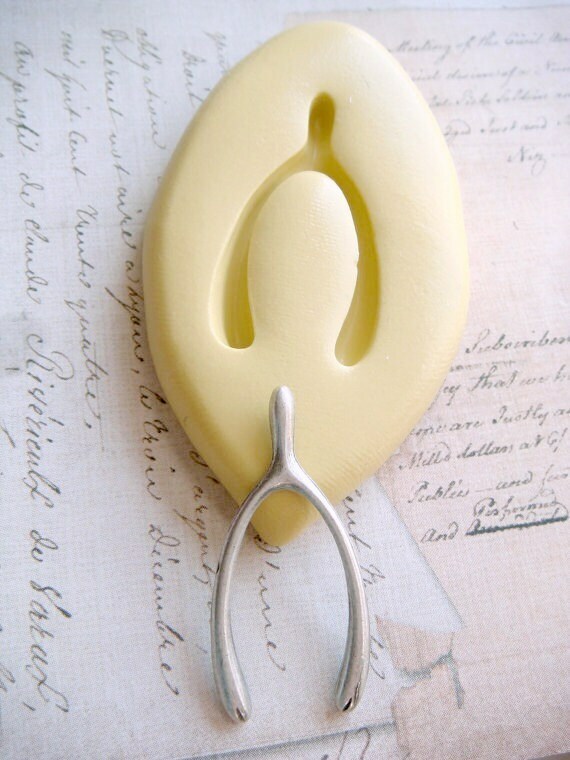 Why not get this flexible wishbone mold on Etsy? I hope you enjoyed seeing all these great uses for wishbones. If you hadn’t seen them around much, you probably will now. So, when you are eating the Thanksgiving turkey this year, be sure and save the wishbone and you just might get your wish. 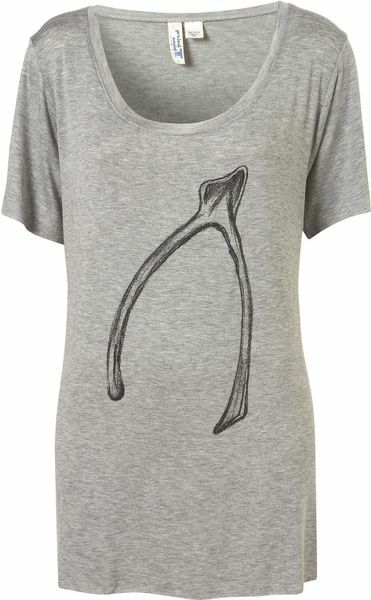 Do you like wishbones? Have you seen a fun project using wishbones? Share in the comments. so good to know that I’m not the only one to not be able to trash a wishbone. When the grandkids were little I saved them to make a wish with, and then I just saved them.